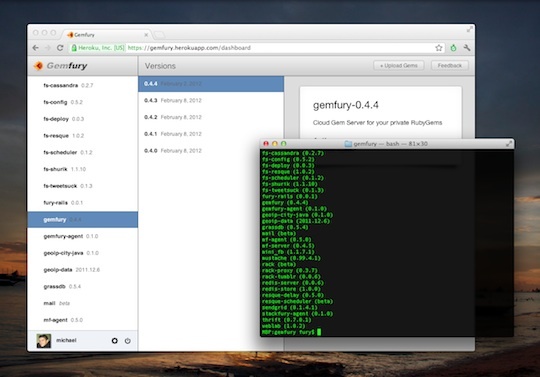 Today we’re officially launching Gemfury to finally bring all the conveniences of RubyGems to your private Gems. What started as an internal collection of scripts has finally turned into a “real thing.” We love using it, and hope that you will too. Just as Dropbox helps you organize and access your files via the cloud, Gemfury lets you securely store your private RubyGems and install them anywhere without the hassle of running your own private Gem server. Perfect to use with Heroku or with other cloud platforms! Your Gems are safe! Your RubyGems are protected during deployment by a secret token that’s part of your Gemfury Source URL. As long as you keep this URL secret, only you can access your Gems. All uploads, deployments, and installations are done via SSL. Gemfury pricing starts at $9/mo. With developers being our target audience, we know that roll-your-own is always an alternative. Saving you hours of tweaking your own Gem server, we think this pricing is appropriate for both organizations and individual developers. Many of our early customers agree. We wanted to thank all of our pre-launch customers for their support - we listened to all of your feedback, and I hope you’re as happy and proud of the outcome as we are. Please keep it coming. We are thrilled that both the Gemfury product and the Gemfury story are strongly relevant to the Ruby community. In the upcoming weeks, we will use this blog not only to talk about using this service, but also share insights and code that we’ve developed while building it. Follow us on Twitter or Facebook if you would like to hear more. Use the new gem.fury.io repository URL in the Gemfile example.